Thought to be exclusive to the Canadian market is this black CP Rail Auto Carrier. It is never found in Bachmann catalogs. 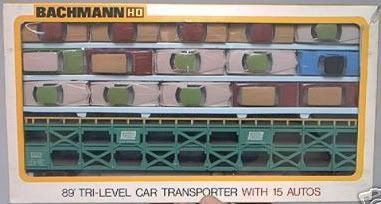 A new addition to Bachmann's rolling stock in the 1976 catalog is the 85' Tri-Level Car Carrier with Cars. Available in two roadnames, Penn Central and Santa Fe, this model sold for $10 and included 15 autos of various body styles and colors. It should be noted that I have included this item here in Bachmann Rolling Stock, but Bachmann included the Tri-Level Car Tronsporter among its Operating Accessories in catalogs. You will also find this car among the listings on the Bachmann Action Accessories page. The September 1976 Railroad Model Craftsman includes a review of the Bachmann Tri-Level. The review states that the Bachmann model compared to the prototype built by Paragon Bridge and Steel Co. with a few exceptions. The Bachmann Tri-Level sits an extra foot taller than this prototype, plus the original features only four braces per side. The Bachmann model is also noted for having unloading ramps on both ends; while the prototypes have them on only one end. The lack of a "fish belly" underframe is also mentioned by RMC's reviewer.